To make the most of service level agreements (SLAs), you need to implement three key steps. These entail establishing a comprehensive strategic sourcing intervention; meeting the critical success factors for a proper governing contract document, and then – naturally – continuous post-implementation measurement. 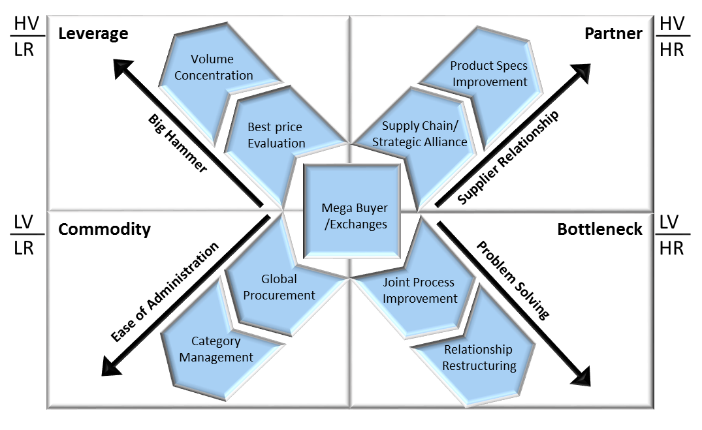 The illustration above is widely recognised in the procurement fraternity. It demonstrates the benefits of effective supplier relationship management (SRM) to an organisation. Furthermore, it illustrates the need to maintain and continue to seek future potential benefit should SRM be effectively executed, as well as the potential consequences should it not. 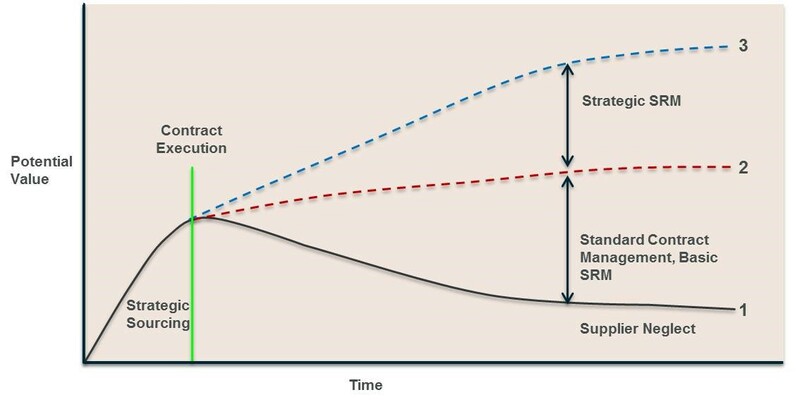 Equating the trendline to a timeline, it points out at least two periods critical to effective SRM in the evolution, specifically contract execution and strategic sourcing. These two events (or periods) are most essential in securing the benefits of effective SRM. Ideally, the rights, duties, obligations and necessary legal requirements are contained in one neat, concise and condense document that is the contract. It is the product of both common and substantive law, and seeks to hold the contracting parties to the attainment of their respective (internal) objectives. For the procurement professional, it forms the basis of contract management. And for the individual tasked with SRM, it forms the basis of his objective, namely the extraction of any and all future potential value. The point on the timeline is the actual, final signed document (“0 BC” or “zero before contract”) following a period of consultation and negotiation. However, neither this point nor its preceding period exists in isolation: both are dependent on the process of strategic sourcing. Strategic sourcing lies before contract on the timeline. Its duration varies in line with the complexity of the procurement intervention, starting with the first date of the intervention in the organisation towards unlocking value. As evolution drives progressive development, so with strategic sourcing. It is a formal approach that results in the optimal selection of supplier(s) and alignment of the supply chain to deliver best value to the organisation and its requirements. The strategic sourcing process is reproducible, analytical, and leads to an increase in value - either by reducing total cost or increasing the service and quality provided. So as demonstrated, strategic sourcing is a process and consists of many critical and essential steps. It is also the period wherein the greatest value is delivered in the shortest period of time. Its fundamental origin lies in data analysis. This too is a small evolutionary process consisting of data extraction, inspection and interpretation, verification, cleansing, transforming and modelling with the goal of finding useful information, making conclusions and supporting decision making. The supporting information is commonly found in the spend patterns of an organisation – no matter how poor the recordkeeping or (ERP, purchasing, payment or financial) systems of the organisation may be. Of course, the poorer the systems, the longer this process takes. Once successfully completed, however, it points towards the correct interested persons (the stakeholders) and enables effective commodity classification. Once commodities (or commodity categories) are correctly allocated to a quadrant, the selection of the appropriate strategy which is aligned to the particular objective is pivotal. It indicates the particular evolutionary route the specific procurement intervention is going to follow. Supplier risk: the need for effective risk analysis cannot be sufficiently stressed. The ‘STEEPLE’ -analysis is one such tool. The inherent risk has a direct relation to cost as it materially influences the contract document that will govern the relationship and the effect it will have on costs. There are predominantly four risk strategies: ‘terminate’, ‘treat’, ‘transfer’ or ‘tolerate’. Should the risk strategy be one of risk transfer, costs from the supplier/service provider will inevitably increase. Think for example of extended warranties for services delivered or payment retentions, stockholding regimes (e.g. Consignment Stock or VMI/VOI) and payment terms (30 days, 60 days, etc). • demonstrable deliverables with corresponding measurement matrices and appropriate sanction/benefit for attainment/non-attainment. Clearly defined demonstratable deliverables, though a component of step two, is the foundation on which step three for effective SLAs, namely measurement, are built and is a condictio sine qua non (causation factor) for effective post-implementation contract managements (and the forerunner to effective SRM). It entails the proper formulation of the SLA objectives, using industry recognised matrices, e.g. “SERVQUAL”. The particular service will dictate the extent of the measurement requirement and its appropriate importance/weighing. Clearly defined key performance areas (KPA) encapsulates the objectives of the SLA and is supported by clearly defined key performance indicators (KPI). The latter conforms to the SMART approach (specific, measurable, attainable, relevant, and time-bound) and are objectively determined to indicate attainment of the particular KPA.